renaming finder items introduced a couple of ways to batch-rename files in the finder using either automator or applescript, depending on the complexity of the job. those examples involved altering the existing filename by replacing characters or removing parts of the name. 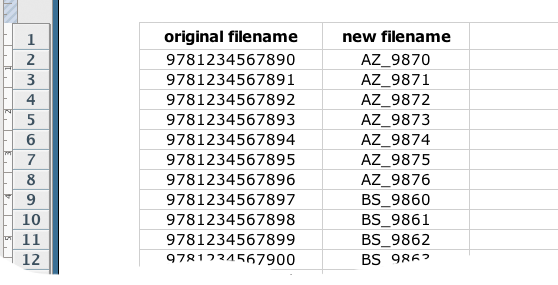 here’s another renaming workflow that was developed when one set of filenames needed to be mapped to a completely different set — hundreds of barcodes named by ISBN needed to be renamed by product code. this solution starts with two lists — original filenames and new filenames — in a single excel worksheet. for this version of the app to work correctly, the worksheet needs to be saved in the same folder as the files to be changed and the worksheet needs to be open in excel. but this script was developed and tested through script editor before being saved out as an app. and this second method is MUCH slower through script editor (although not much different when run as an app). try it yourself. • related post : renaming finder items : renaming using automator or applescript. 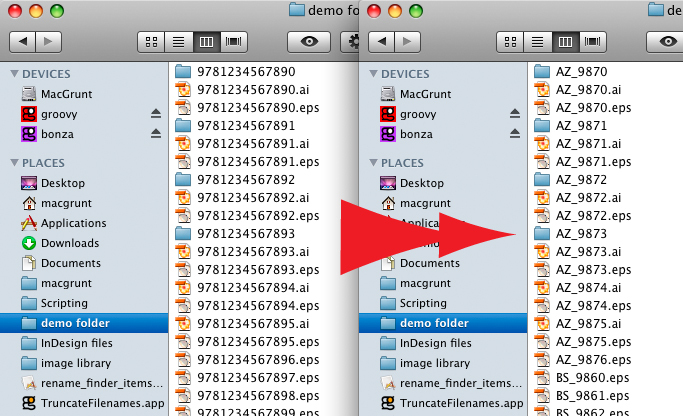 • related post : renaming finder items III : renaming by creation date. This entry was posted in applescript, OS X and tagged applescript, Excel, file renaming, finder, how to, Mac, OS X, OSX, tutorial by macgrunt. Bookmark the permalink. I am not very experienced in this subject. I’m currently involved in a project for online sales and rental of percussion instruments for orchestras. We have about 250 pictures of instruments, all named in Dutch. I need to create an English, French and German picture folder… and translate every picturename accordingly. This has been done in a spreadsheet and a .CVS file. I would like to rename every picture in Finder in bulk, and this is (so far) the only solution I have found. So I would really use the app! Thanks in advance for your help. „«class 1756»“ versteht die Nachricht „count“ nicht. So, you are able to open it in Script Editor but get the error message when you try to run it — is that correct? If this is the case, you should be able to see which line causes the error. Could you please tell me that line — hopefully we can find the problem that way. 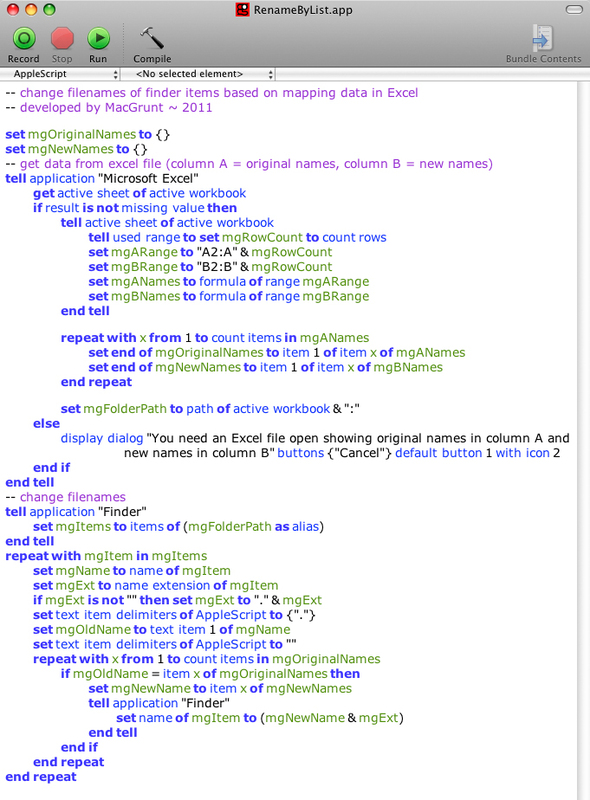 Hi macgrunt – I’m working with a large dataset of multiple Excel workbooks/files. I need to batch rename all of these. When I run your script/app, it seems to work up to retrieving the files’ extension (.xsl), but then it quits… trying to figure out what goes wrong. I’m working from Snow Leopard (10.6.8). Any help would be much appreciated! A good way to troubleshoot is to open the app in Script Editor (applications > applescript) and run it from there (green ‘run’ button) with the Event Log History window open. You get to see what the app is doing and where it hangs up. If you like, you can send the resulting transcript to macgrunt.au@gmail.com and I’ll see if I can work out what is going on.